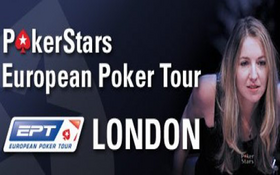 It’s a little odd for the money bubble to burst on Day 2 of a major poker tournament –something that usually takes place on Day 3, and sometimes even as late as Day 4– but this is precisely what happened at the PokerStars European Poker Tour London tournament yesterday. The original field of 848 players had been whittled down to just 380 for the start of Day 2, and when the smoke cleared just 128 players remained in the tournament. Each of those 128 players is now guaranteed a payday –starting at £7,500 for 128th place, and going all the way up to £900,000 for the winner of the tournament. Tournament officials decided to halt play once the money bubble had been burst yesterday, which means the remaining players are in store for a very long Day 3, where they will play down to just 24 players. This entry was posted on Saturday, October 2nd, 2010 at 12:11 pm and is filed under Poker News. You can follow any responses to this entry through the RSS 2.0 feed. You can leave a response, or trackback from your own site.